After young birds have left the nest and can fly short distances, they still follow their parents and beg for food. They squawk and assume a begging posture, wings drooping and head hunched down. 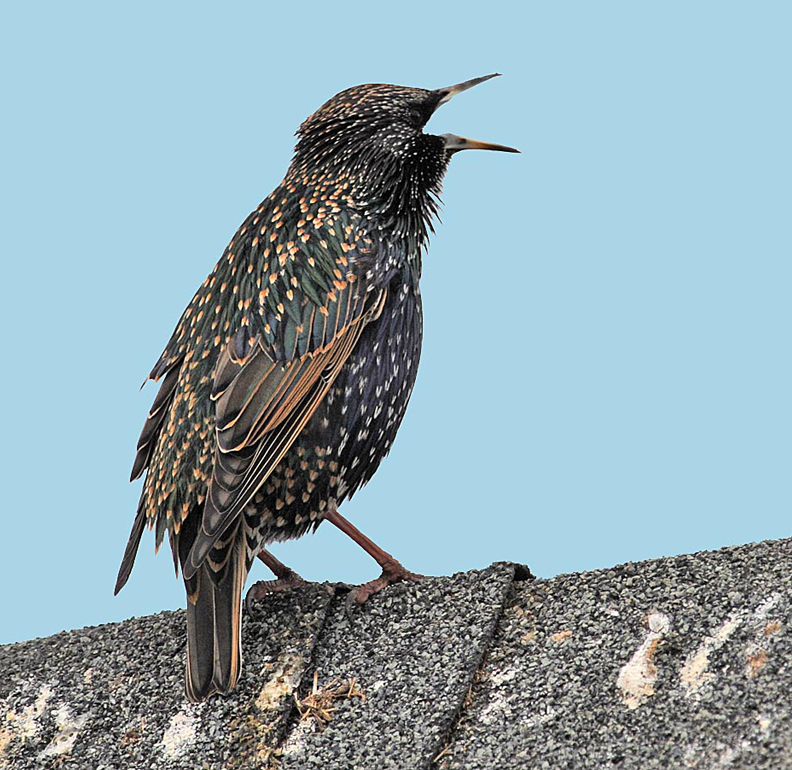 Most young birds, including this European Starling, depend on their parents for days, weeks, or even months after leaving the nest. Sign up for our podcast and hear BirdNote day or night! We’re hearing the call of a hungry young gull [Call of juvenile gulls], tagging along as its parent scavenges the beach for tidbits. Now, here’s a fledgling Great Horned Owl [Call of juvenile Great Horned Owl] perched in a tree, begging its parent to fly in with dinner. And here’s another juvenile [Call of juvenile Hairy Woodpecker] – a young Hairy Woodpecker, hitching along behind its parent on a mossy branch. By this time of year, these young birds are full sized. They’ve left the nest and can fly short distances, but they still follow their parents and beg for food. Not only do they squawk and quiver, they also assume a begging posture, head hunched down, with wings drooping. Some baby birds, like ducklings, goslings, and quail, feed themselves immediately after hatching. But most young birds depend on their parents for days, weeks, or even months after leaving the nest. Stick around with us and you can get BirdNote as a podcast! It all starts at birdnote.org. I’m Michael Stein. Bird calls provided by The Macaulay Library of Natural Sounds at the Cornell Lab of Ornithology, Ithaca, New York. Juvenile Glaucous-winged Gull recorded by E.S. Booth. Juvenile Great Horned Owl recorded by D.S. Herr. Hairy Woodpecker recorded by R.S. Little. Mexican Jays recorded by G.A. Keller. 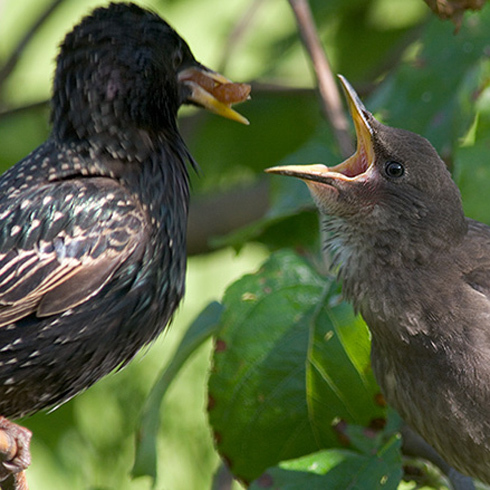 Catch a video of BIG baby Starlings begging!